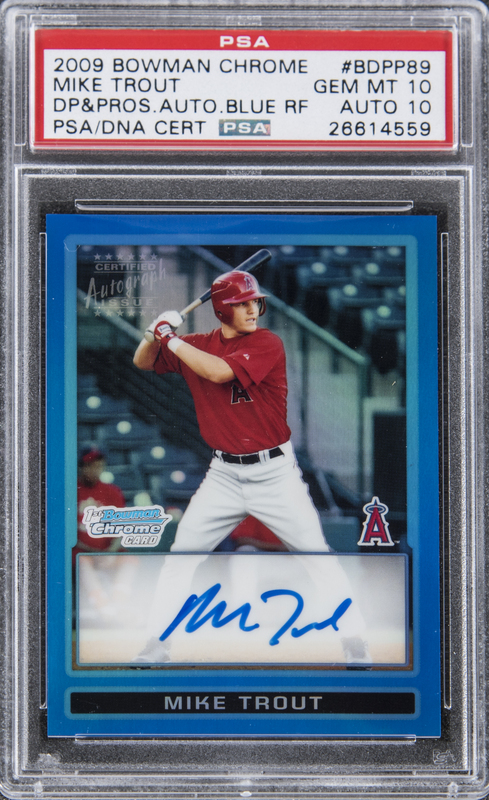 Lot Detail - 2009 Bowman Chrome Draft Prospects #BDPP89 Mike Trout (Blue Refractor) Signed Rookie Card (#65/150) – PSA GEM MT 10/Auto 10 "1 of 2!" 2009 Bowman Chrome Draft Prospects #BDPP89 Mike Trout (Blue Refractor) Signed Rookie Card (#65/150) – PSA GEM MT 10/Auto 10 "1 of 2!" Graded GEM MT 10 by PSA, with signature graded "10" by PSA/DNA. Rookie Card. Among twenty-two copies recorded in PSA’s census reporting, just two examples have achieved this specimen's top-level tier. A truly stellar, once-in-a-lifetime ballplayer, Mike Trout's statistical accomplishments at his age compare favorably to virtually all of those levels set by the game's greatest stars. 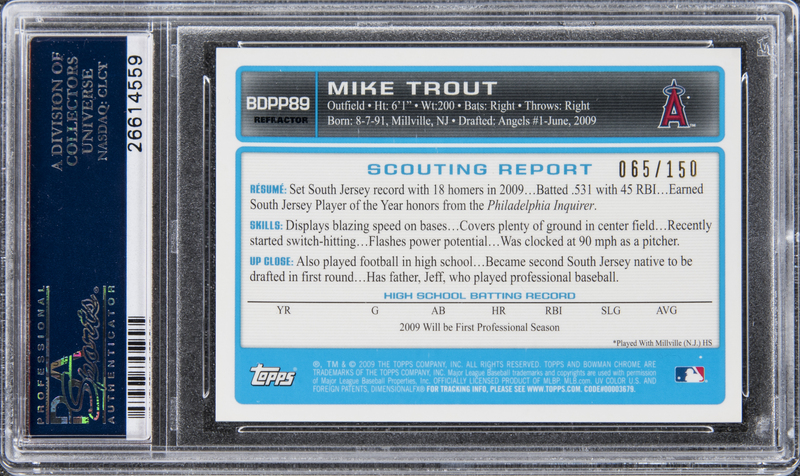 Trout has placed a vibrant, blue ink signature on the obverse of this elite collectible. A "Topps Certified Autograph Issue" logo appears on the card's obverse; this statement attests to the signature's authenticity, and serves as the COA for the subject item. The exclusive, limited-edition piece is serial-numbered "65/150." 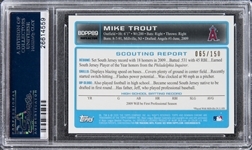 Here's a centerpiece Trout collectible, in stunning Gem Mint condition.